A friend asked, so I threw together a quick list of the local commerce, local economy, economic inclusion, and town and urban planning accounts that I follow on Twitter. In no particular order, here they are. Editor of @CityLab at @TheAtlantic. Stories and justice for all. Think tank and civic enterprise renewing America in the digital age. Focusing on Community Broadband Networks (mostly fiber-optic) - the essential infrastructure communities need. Main Street America™ is a program of the National Main Street Center focused on preservation-based community revitalization. Michael H. Shuman makes the case for economic localization through books, articles, talks, blogs, and mischief. Advocates for Independent Business. A coalition of 10 national organizations working to ensure a vibrant future for locally owned, independent businesses. A collaborative seasonal campaign by indie business advocates across North America. Choose local and independent! Supporting local independent businesses, growing vibrant local economies & building strong local communities. MSA/MSA Action Fund is a national network of small biz coalitions that create opps for real small business owners to speak for themselves. Inspiring small businesses to celebrate their local roots and helping consumers understand why it's important to support them. Working with cities to develop technology that solves big urban problems. Sign up for our weekly newsletter at the site. If you believe in shopping local and the philosophy that the strength of Main Street will shape the future of our towns and cities, then please follow! Building Community and Strengthening Economies around the Nation. Contact @NStumoLanger (stumolanger@ilsr.org) for media inquiries. Smart Growth America advocates for people who want to live and work in great neighborhoods. We are improving lives by improving communities. BALLE creates real prosperity by connecting leaders, spreading solutions and driving investment resulting in strong local economies. We’re co-creating a better Hudson Valley: vibrant, sustainable, locally rooted and human scale with equal concern for people, planet and profit. Localism! Buying gifts is hard. Buying distinctive gifts is harder. Buying distinctive gifts that mean something is harder still. But buying distinctive, meaningful, practical gifts that capture the inventiveness and essence of a place is fairly simple, now. Because once again Hudson Heartland is happy to present a Holiday Shopping Guide featuring items that are sourced (or branded) from within Orange, Sullivan and Ulster counties (with some peripheral overlap, maybe), available for online orders (or a quick phone call), and available to ship. The list is below, but while we're talking there's also an in-person shopping event you can hit if you're here: The Hudson Valley Farm & Flea in Newburgh on November 25. So, to the list. If you are: a) a Hudson Heartlander at home who wants to send a gift to a friend who lives elsewhere or b) a Hudson Heartlander who's away who wants to share the allure of your native soil with your new "locals" or c) a one-time visitor to the region who never forgot it or d) someone who wants to sustain your small-business neighbors—then these gifts are ideal holiday presents. Click to buy or browse these sites for more cool ideas! Merry Christmas, Happy Hanukkah, Joyous Kwanzaa, and/or a gift-free Festivus to you! Please comment in your favorite local online gift sources! My 2017 Running columns from the Middletown Times Herald-Record. With the formal 2016 race season winding down, here are Bill Braine's Running columns from the Middletown Times Herald-Record from the past seven months. The column hibernates and will return in spring, lean and hangry and fleet of foot. Run well this winter. Run the Hambo Marathon: You can do it! We're really glad to announce the launch of TickTime, a friendly app to help protect against tick-borne disease. Take a look! If you want to give Hudson Valley gifts this season and don't live nearby (or if your recipients don't live here), here are a few candidates. These are regionally produced items you can order online and have shipped. Of course you’ll start with Bone Hollow; like it, the rest of these items will help the region’s economy and bypass big-box and big-e-commerce. Plus they’re crazily distinctive and diverse and cool and useful. Chronogram is a regional magazine dedicated to stimulating and supporting the creative and cultural life of the Hudson Valley. And of course, direct from hudsonheartland.com. Library news and events coming up, too. I like to shop on Amazon, but everything I understand about how they treat authors, publishers, and bookstores made me want this experiment to not-include them. Will that mean fewer copies sold? Possibly. It will add a couple of clicks to the purchase flow, and it will mean a short delay before you're reading on your Kindle. Will it mean less revenue? Maayyyybe. Will it mean that more money from every copy sold stays in the storyshed? Yes. Got a bunch of these today. Finalizing this website and the ordering pages and the digital versions in the next two days, and expect to be selling on Monday March 2. Hey, it’s Pete! Say hi to Pete, everyone. Pete’s the customer service rep at the printer where Bone Hollow is being produced. He works in Castleton, New York, at IBT Hamilton. They’re my publisher’s preferred printer for some of the same reasons my publisher is my preferred publisher: They do a great job and they’re close to home. They also have every kind of printing machine in use from the mid-1800s until now—including the digital press and bindery that will produce Bone Hollow later this month. I think "creating local" is a smart way to work. You draw your stories from where you are, and you get deep in there and find that where you are contains the whole universe. But also, if you're making something and you want to talk to someone who's helping you do that, you can do that. In person. In the place where they work. A lot of authors probably don't get to chat with the printer. Me? If I feel like it I can say hi to Pete. And thank him for helping me get my first novel published. My wife and I were driving a babysitter home not long after we'd moved up to this town from the other town to the south, and as we passed the country club where I'd married a beautiful, intelligent, progressive and funny woman one time, I saw a white-spotted pink boulder nestled in a stone wall. "Rebecca," I said to the babysitter. "Do you know what kind of rock that is?" Rebecca did not. Not because she wasn't smart, but because there was really no reason for a 16-year-old girl to know anything about Schunnemunk conglomerate, not unless she wore thick braids and coke-bottle glasses and played English horn and collected bugs, and these things Rebecca did not do. Nevertheless, for a couple of minutes — as long as I harangued her about the distinctive rock, which is found nowhere else in the region and appears only in smaller patches in northern New Jersey — she was edified on the subject. Schunnemunk conglomerate. Doubtless she forced the mineral out of her mind as quickly as possible upon arriving home (home, which was back in the town we'd lived in earlier; this was before we'd integrated into our new digs, when the people of our new town still called us city folk and threw kittens into our well) by listening to that M&M and that Molly Cyprus woman or watching Dancing with the Chef. This is what it looks like, and this is where it comes from. Schunnemunk is a long narrow ridge, recently named a state park, that is ribboned with trails and rattlesnakes. That scene in Michael Clayton, when Clooney runs away from the burning car? He runs up the northern terminus of the Jessup Trail, which continues for about ten miles along the ridge. Also up there are the Dark Hollow, the Sweet Clover, the Long Path, and the trail up High Knob. At the high points where the soil doesn't cling, this peculiar pink stone larded with quartz shows itself between the pine scrub. 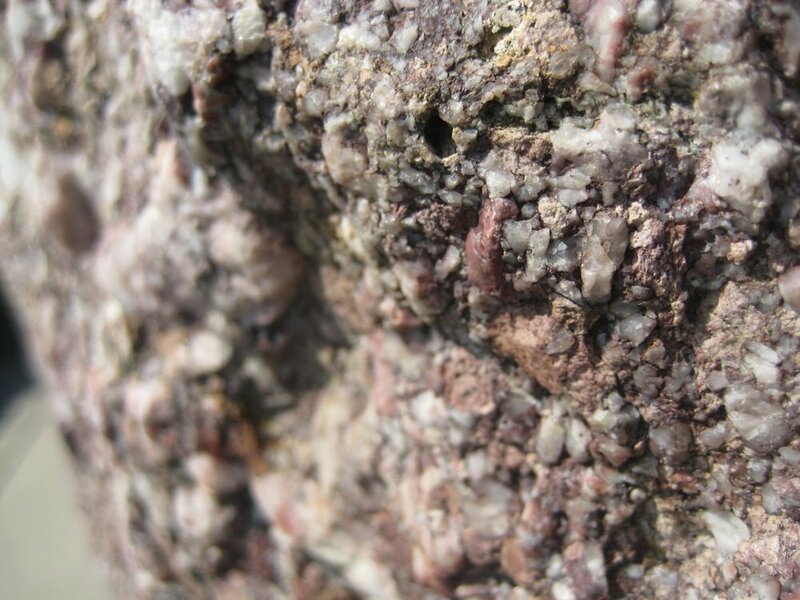 It's a tacky-colored puddingstone, mauve, from the late Devonian, when such things were in fashion. Here's where a better or worse writer might go for the metaphor. Certainly the territory is rich: remember, we're driving past the site of our wedding, the stones of this mountain are made up of these tiny quartz moments embedded in sandstone, and the whole ridge — a 3,000-foot thick cap of conglomerate atop earlier Devonian deposits — is highly durable and resistant to the elements. People have used the stone for centuries around these parts, and it has made its way from town to town. There's a millstone made from it beside a pond in Monroe; chunks of the rock are mixed in with the local gneiss in the stone planters outside the Town Hall in Highland Mills; Central Valley's got it in spades. Like the bits of quartz in their sandy matrix, pieces of Schunnemunk are embedded in the lives of the people who live in this region. A better or worse writer might say that it is like my wife and me, this slightly tacky but useful stone, comprising sand and fire, part of the earth of these valleys; sometimes slightly invisible to the residents, but slowly incorporating into the local fabric. But what a better or worse writer might not realize is that there's no excuse for boring a high school junior with her whole life ahead of her so badly that her eyes wander to the distant horizon, over the ridge she doesn't even see anymore, to dream of a place — far, far away from this town and the aging nerd in the front seat, babbling about rocks — from which she will never want to return.